Affordability drew the couple to Paal, but also the fact that the company had a design, the Elizabeth, which was similar to the footprint they originally intended. With some layout and room size changes, they were able to create a home they love. “The Paal team were incredible. They were very accommodating of the changes we wanted to make, and absolutely embraced what we wanted to do, buying into our vision for the house. They came up with great ideas too, including an alfresco area that gives us a lot of outdoor living space,” says Rebecca. As a telecommunications engineer, Stephen knows a thing or two about building sites. While he took on the electrical work and as much of the labouring as he felt comfortable doing, he arranged for other trades to help with the build. 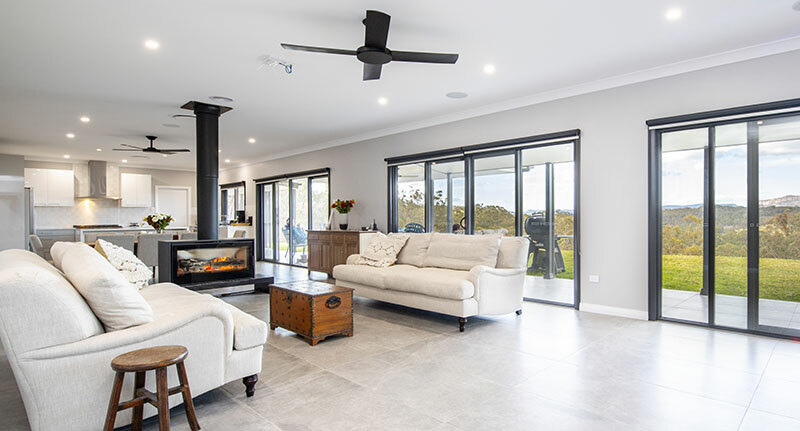 The home took almost twelve months to complete, largely because Stephen and Rebecca commute from Sydney and were not able give the project a full-time commitment. “The process was pretty seamless though. If something cropped up, the Paal team was ready to help at every step of the way,” says Stephen. The home is completely off-grid, with solar power, rain tank and bore water. It’s double-insulated to cope with the weather extremes of the high country. The couple admit to spending many hours conducting online research before committing to building with Paal. “Thanks to Google you can find out just about anything you want about a company,” says Stephen. “We kept coming across good customer reviews for Paal – quality of materials and ease of construction and after-sales service.